Are you planning to throw a party for your friends, and have an Indian Menu on your mind? More often than not, one finds it hard to narrow down to what dishes you would serve - picking out your favorites that will work well with a diverse group is obviously a difficult choice. So here is a sample Indian Party Menu that I have created just for my readers. From Appetizers to Main Course, Sides and Desserts, this is a perfect gathering which will please all your guests, whether Indian or not. Check out what delicacies lie beyond! Start your meal in a grand style by serving any one or a combination of these appetizers. Paneer Tikka with Mango Dressing is a classic, while for bite-sized appetizers, you can opt for these Paneer & Asparagus Lollipops or these fancy Moong Dal Basket Kachoris. If you want to keep it really simple, opt for something non-traditional, like these Baked Zucchini Fries or Vegetarian Spring Rolls. When it comes to main course, at least one of your dishes has to have Paneer in it - it's a must!! 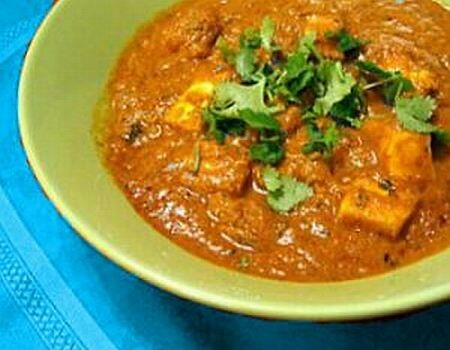 My personal favorites are the Paneer Butter Masala or the quick and easy Saag (Palak) Paneer. Other non-paneer options include Mix Vegetable Korma, or Hyderabadi Baghara Baingan, which will be a big hit with spice-lovers in your group. Choose to serve these with simple Rotis or Parathas, or something fancy like Tandoori Naan, if you like, and have the time to make these at home. For some people, a meal is incomplete without eating Rice. If you have thse people in your group, then opt for something simple like Jeera Rice, served with old-fashioned home-style Toor Dal. However, my recent favorite recipe is Pomegranate Rice Pulao with Pecans - an instant hit, and very easy to make! Whatever you choose to serve, be sure to cook your food with a happy mood. Because all your emotions will reflect in the final outcome, and result into a happy Meal that everyone will enjoy. Plan ahead of time, so you don't have to do everything on the d-day; most of the curries and desserts can be prepared a day in advance. Hope you like this list of Indian recipes, and may it help you throw an unforgettable party! If you need more inspiration, check out tonnes of more Indian recipes over at Fun and Food Cafe. reall helpful post. its very imp to always have a great meu at hand to manage those sudden parties. Thank you! This post is going to be so helpful.Perfect combination of foods and recipes for a party. Great recommendation. They do sound good!